View of the Parkman Bandstand on a glorious day after a night and morning of rain. 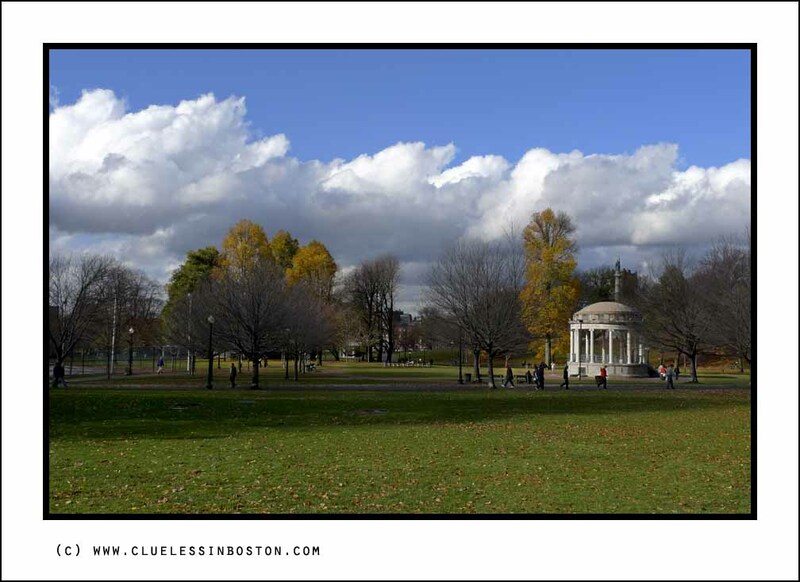 The Parkman Bandstand was named for one of the Boston Common’s greatest benefactors, George Francis Parkman Jr. Parkman died in 1908 and left $5 million for the care of the Common and other city parks. The bandstand was originally dedicated in 1912 and was restored in 1996. Visit other Skywatch Friday sites. a postcard-perfect shot! thanks for dropping by my SWF. Looks like a beautiful fall day. Those clouds really pop out against the bright blue sky and the bandstand looks lovely in the autumn sunlight. After the end of the rain, the place seems all cleaned and refreshed! I'd like so much to stroll there, I like the little ..monument? Gazebo?.. on the right. Whatever it is, it gives a romantic touch to the scenery. Beautyful picture, indeed! The sky makes the shot. Many of the parks in England used to have wrought iron victorian bandstands. I remember as a kid in Sheffield that there would frequently be someone playing on a Sunday. They are pretty much unused now though. It's also a glorious sky!I loved those clouds! It is so serene to look at. Great sky shot! It's always nice to see the rain end and that beautiful blue sky appear! I enjoyed the history of your lovely sky showing today. The way you presented the picture makes it even nicer. You framed it so well. This is a wonderful shot. Nice blend of colours and composed very well. It's a postcard finish. Wonderful shot, love the bandstand, clouds and the pretty blue sky. A perfect composition ... has tremendous interest, great colors, and the light is superb! A lovely tranquil setting. Fantastic clouds. I wish I could come and sit on one of those benches and enjoy it first hand. This is beautiful! The light is perfect on the bandstand, and the sky adds drama and appeal. A lovely autumn day! The bandstand looks very elegant too. Classic charm, smooth and paint. A superb scene, a wonderful picture! Fantastic display of clouds over a scene that's gorgeous in itself.